This study was conducted to examine the frequency, phenotype, and functional profile of T lymphocytes that proliferate in response to type I collagen (CI) in patients with scleroderma (SSc). Peripheral blood mononuclear cells (PBMCs) from SSc patients, healthy controls, and rheumatoid arthritis disease controls were labeled with carboxy-fluorescein diacetate, succinimidyl ester (CFSE), cultured with or without antigen (bovine CI) for 14 days, and analysed by flow cytometry. Surface markers of proliferating cells were identified by multi-color flow cytometry. T-cell lines were derived after sorting for proliferating T cells (CFSElow). Cytokine expression in CI-responsive T cells was detected by intracellular staining/flow cytometry and by multiplex cytokine bead assay (Bio-Plex). A T-cell proliferative response to CI was detected in 8 of 25 (32%) SSc patients, but was infrequent in healthy or disease controls (3.6%; p = 0.009). The proliferating T cells expressed a CD4+, activated (CD25+), memory (CD45RO+) phenotype. Proliferation to CI did not correlate with disease duration or extent of skin involvement. T-cell lines were generated using in vitro CI stimulation to study the functional profile of these cells. Following activation of CI-reactive T cells, we detected intracellular interferon (IFN)-γ but not interleukin (IL)-4 by flow cytometry. Supernatants from the T-cell lines generated in vitro contained IL-2, IFN-γ, GM-CSF (granulocyte macrophage-colony-stimulating factor), and tumour necrosis factor-α, but little or no IL-4 and IL-10, suggesting that CI-responsive T cells express a predominantly Th1 cytokine pattern. In conclusion, circulating memory CD4 T cells that proliferate to CI are present in a subset of patients with SSc, but are infrequent in healthy or disease controls. Systemic sclerosis (scleroderma) (SSc) is characterised by immune activation, microvascular dysfunction, and progressive fibrosis. Increased deposition of type I collagen (CI) is evident in the skin and involved internal organs of patients with SSc . Cellular components and soluble mediators of the adaptive immune system play a central role in disease pathogenesis . Activated T cells and levels of soluble interleukin (IL)-2 receptor are increased in the peripheral blood of patients with SSc [3–5]. In the skin, cellular infiltration precedes dermal fibrosis and consists of activated T lymphocytes, plasma cells, and macrophages [6, 7]. Helper (CD4) T cells predominate, and the degree of cellular infiltration correlates with both the degree and progression of skin thickening . Memory T cells are also present in the inflammatory infiltrate of affected internal organs, such as the lungs . There is evidence to suggest that the activation of T cells in SSc is antigen-driven . Analysis of the T-cell receptor repertoire in skin biopsies of patients with SSc revealed that T cells have undergone clonal expansion. Indeed, the presence of a dominant T-cell clone in skin biopsies obtained from a patient at different time points and from different skin regions implies that the putative driving antigen is persistently present and widely distributed . Putative antigens in SSc include DNA topoisomerase I, RNA polymerases, and microbial products. CI has also been implicated as an autoantigen in SSc, and several reports suggest that patients with SSc exhibit cellular immunity to CI [12–14]. Peripheral blood mononuclear cells (PBMCs) from the majority of patients produce chemotactic cytokines when cultured with CI . CI-stimulated PBMCs from patients with SSc produce IL-6  and IL-2; the latter is predominantly derived from CD4+, but not CD8+, T cells . McKown et al. reported that PBMCs from most patients with SSc produce IFN-γ, IL-10, or both when cultured with the α chains of CI . Lymphocyte proliferation to CI, measured by tritiated thymidine incorporation, has been reported to occur in a subset (25%) of patients with SSc , although this was not confirmed by other investigators . The study of antigen-specific lymphocytes is challenging because these cells are rare in the peripheral blood. Recently, a flow cytometric method that allows the concurrent analysis of the phenotype and proliferative response of antigen-specific T cells was used to study the immune response to a specific antigen . We employed a similar method to demonstrate that, in a subset of patients with SSc but rarely in normal or disease controls, circulating CI-responsive CD4 T cells are present. T cells proliferating in the presence of CI express an activated, memory phenotype and secrete Th1 cytokines. Patients with a diagnosis of limited or diffuse SSc according to the criteria of the American College of Rheumatology (ACR) (1980)  were recruited from the Rheumatology Clinics of the University of Tennessee Health Science Center (Memphis, TN, USA). Patients with SSc-like illness related to environmental, ingested, or injected agents, localised scleroderma, or eosinophilic fasciitis were excluded from the study. Healthy controls were recruited from among staff and allied health workers at the University of Tennessee. Disease controls, all carrying a diagnosis of rheumatoid arthritis according to ACR criteria , were recruited from our Rheumatology Clinics. All subjects gave written consent, and the research protocol was approved by the Institutional Review Board. Bovine CI and β1,2 chain (dimers formed by the component α-1 and α-2 chains) were provided by the Collagen Core facility of the Rheumatic Disease Research Core at the University of Tennessee Health Science Center. Bovine CI was prepared as previously reported [15, 20]. The homogeneity of CI was confirmed by sodium dodecyl sulfate-polyacrylamide gel electrophoresis and by cyanogen bromide peptide mapping. Fluorochrome-labeled antibodies specific for human lymphocyte surface markers (CD3, CD4, CD8, CD28, CD45RO, CD25, CD212/IL-12R β2, and CD49a) and human cytokines (IFN-γ and IL-4) were obtained from BD Biosciences (San Jose, CA, USA). Human rIL-2 was obtained from Sigma-Aldrich (St. Louis, MO, USA). Cell culture medium ('complete medium') consisted of RPMI-1640, 2 mM l-Glutamine, 1% non-essential amino acids, 1% sodium pyruvate, 100 U/ml penicillin, 100 μg/ml streptomycin, 25 mM HEPES Buffer, and 55 μM 2-mercaptoethanol (all from Invitrogen, Carlsbad, CA, USA) and 9% fetal calf serum (Sigma-Aldrich). A positive proliferative response to CI was defined as a greater-than-twofold increase in proliferating T cells (CFSElow) in response to antigen. Surface markers of proliferating cells were identified by multi-color flow cytometry with fluorochrome-labeled antibodies to CD3, CD4, CD8, CD28, CD45RO, CD25, CD212 (IL-12R β2), and CD49a. Briefly, lymphocytes were stained for 30 minutes at 4°C with PerCP- (peridinin-chlorophyll-protein) or PE- (phycoerythrin) conjugated antibodies. Appropriate isotype controls were used to determine background staining. After washing of unbound antibody, samples were analysed on a FACScan flow cytometer (Becton, Dickinson and Company, Franklin Lakes, NJ, USA), and the frequencies of cell subsets were calculated using WinMDI software (Joseph Trotter; The Scripps Research Institute, La Jolla, CA, USA). CI-responsive T-cell lines were generated from the PBMCs of three patients which demonstrated a positive in vitro proliferative response to CI (as defined above). After 14 days of culture with antigen, cells were collected and stained with anti-CD4 PE. CFSElowCD4+ cells or CFSEhighCD4+ cells were then sorted using a FACSCalibur (BD Biosciences) CFSElowCD4+ cells were further expanded by two to three rounds (every 10 days) of in vitro activation with irradiated (4,000 rad) autologous PBMCs (106/well), antigen (CI or β1,2 chain), and IL-2 (20 U/ml). After the last round of activation, cells were rested for 10 days prior to additional experiments. Resting T-cell lines (106/ml in 48-well plates) were restimulated with PMA (phorbol 12-myristate 13-acetate) (50 ng/ml) and ionomycin (500 ng/ml) in the presence of brefeldin A (10 μg/ml; GolgiPlug; BD Biosciences) for 5 hours. The cells were then harvested, stained with antibodies to surface markers (CD4) for 30 minutes, fixed (20 minutes, 4% paraformaldehyde/PBS), and stored at 4°C overnight. Next, the cells were permeabilised (BD Perm/Wash; BD Biosciences) and then stained with cytokine-specific antibodies at 4°C for 30 minutes. Parallel samples were incubated with appropriate intracellular isotype controls. Samples were run on a flow cytometer, and at least 30,000 events were collected. Data were analysed using the WinMDI 2.8 software (The Scripps Research Institute). In separate experiments, resting CI-specific T-cell lines were activated in vitro for 72 hours with plate-bound anti-CD3 (10 μg/ml) and anti-CD28 (1 μg/ml). Cells were incubated at a concentration of 2 × 106 cells per ml in a 48-well plate, and supernatants were harvested after 48 hours of culture. T-cell line supernatants were then assayed for cytokines using a multiplex cytokine bead array system (cat. no. 171-A11050 Bio-Plex; Bio-Rad, Hercules, CA, USA) according to the manufacturer's instructions. The reaction mixture was read using the Bio-Plex protein array reader, and data were analysed with the Bio-Plex Manager software program in the Rheumatic Disease Research Core Center, Veterans Affairs Medical Center (Memphis, TN, USA). Descriptive statistics were generated using SigmaStat software (version 2.03; SPSS Inc., Chicago, IL, USA). The proportion of patients and controls demonstrating reactivity to CI was compared using the Fisher exact test (SigmaStat software). We enrolled 25 patients with SSc for this study. The mean age was 55.4 (± 10.9) years, and 72% of the subjects were female. Most patients had limited cutaneous disease, and eight (32%) had diffuse disease. The average SSc disease duration was 10.29 (± 9.8) years (Table 1). PBMCs from SSc donors were labeled with CFSE and then cultured with and without CI. To further expand the CI-specific population, IL-2 was added at day 7 and the cells were harvested at day 14. In the CI-treated cultures, we observed the expansion of a CFSElowCD4+ T lymphocyte population. A much smaller population of CFSElowCD4+ T lymphocytes was present in the PBMCs cultured without antigen, suggesting that the CFSElowpopulation emerges due to antigen-induced proliferation. Other studies have shown that this method correlates very well with cell proliferation measured by [3H]-thymidine incorporation . A distinct advantage of this method is that proliferating cells are viable and can be used for additional experiments such as immunophenotyping and functional analyses. To confirm our findings, concurrent experiments were conducted in select patients, using highly purified β1,2 chain (heterodimers of α-1 and α-2 chains) of CI as antigen, and similar results were obtained (Figure 1a). A positive proliferative response to CI was defined as a greater-than-twofold increase in proliferating cells (CFSElow) in the presence of CI. Approximately one third of the patients with SSc demonstrated reactivity to CI, whereas CI reactivity was rare in control cohorts (p = 0.009). Only one of 19 healthy individuals demonstrated significant T-cell proliferation to CI, and none of the patients with rheumatoid arthritis reacted to CI in vitro (Table 2). Among those patients exhibiting a proliferative response to CI, the mean percentage of proliferating CD4 T cells increased from 11% (± 9.97) in control wells to 28.7% (± 19.4) in the CI-stimulated wells (p = 0.04). T-Cell Proliferation to C1. (a) Peripheral blood mononuclear cell proliferation monitored using carboxy-fluorescein diacetate, succinimidyl ester (CFSE) labeling. 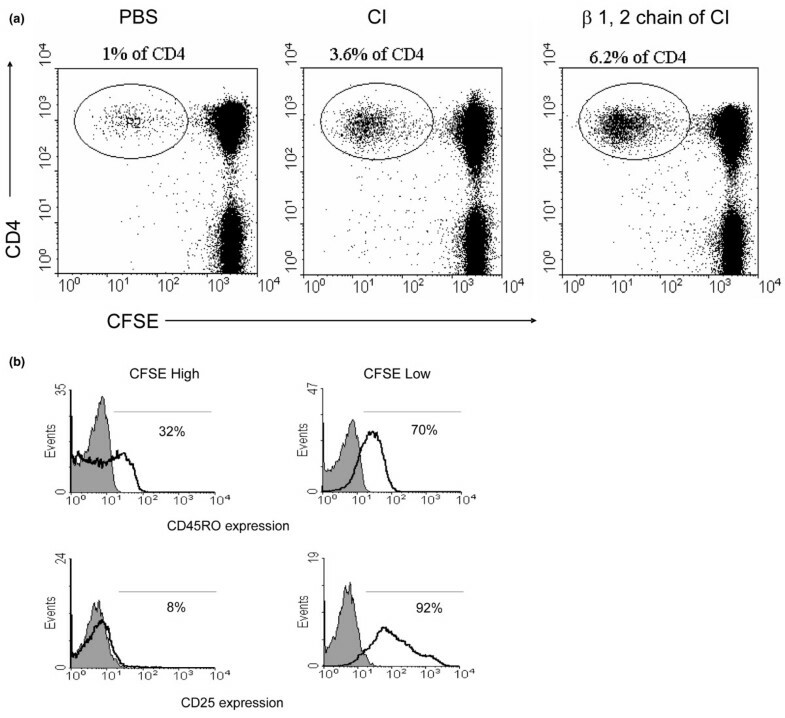 Representative dot plot of CFSE/CD4 double-labeling demonstrates increased T-cell proliferation (CFSElow) in response to (in vitro culture with) type I collagen (CI) or β1,2 chain. (b) CI-reactive lymphocytes express an activated, memory phenotype. Representative histogram demonstrates that the majority of CFSElow (that is, antigen-specific proliferating T cells) express CD45RO and CD25 (right panels) compared with the CFSEhigh (non-responsive to antigen) T cells (left panels). Grey shaded areas represent staining with the appropriate isotype control. PBS, phosphate-buffered saline. Positive proliferative response to type I collagen (CI) was defined as a greater-than-twofold increase in proliferating cells (CFSElow) in the presence of CI. Approximately one third of patients with scleroderma (SSc) demonstrate reactivity to CI, which was significantly higher than the proportion of controls (healthy and rheumatoid arthritis combined) responsive to CI (p = 0.009). In the patients with SSc, there was no significant difference in disease duration between the CI responder group (median disease duration 10 years) and the CI non-responders (median disease duration 6 years; p = 0.561). There was no correlation between CI responsiveness and pattern of skin involvement (limited versus diffuse; p = 0.359). None of the SSc-related disease manifestations was predictive of an immune response to CI in vitro, except for a trend toward more lung fibrosis in the CI responders. Of the CI responders, 87.5% had pulmonary involvement, whereas only 47% of the non-responders had this complication (p = 0.09). It is possible that in a study with a larger sample size a significant difference would be observed. Furthermore, we used three-color (CFSE, PE, and PercP) flow cytometry to compare the cell surface characteristics of CI-responsive T cells (CFSElow) with the non-proliferating cells (CFSEhigh). In patients who exhibited a significant proliferative response to CI, PBMCs (at day 14 of culture with CI) were stained with fluorochrome-conjugated antibodies to CD3, CD4, CD25, CD45RO, and CD212 (IL-12 receptor β2). Using flow cytometry and by electronically gating on the CFSElow population, we determined that CFSElow cells were CD3+CD4+ T cells that preferentially expressed the activation marker CD25 (IL-2 receptor α) and the memory T-cell marker CD45RO. As expected, the CFSEhigh, non-proliferating population included both naïve and memory T cells that were not activated and did not express the IL-2R (Figure 1b). Although CD212 has been implicated as a useful surface marker for Th1-polarised T cells , we did not detect expression of this marker on CI-activated, proliferating T cells (data not shown). We generated three CI-activated T-cell lines from three different patients, all exhibiting a T-cell proliferative response to CI (as determined by CFSE staining and flow cytometry). After in vitro activation of PBMCs with CI, the CFSElow population (antigen-activated) was sorted by flow cytometry and expanded with autologous, irradiated PBMCs, antigen, and IL-2. All cell lines were CD3+CD4+CD8-CD28-CD25+CD49a+(Figure 2). Phenotypic analysis of type I collagen (CI)-responsive T-cell lines. T cells were expanded in vitro with autologous peripheral blood mononuclear cells, interleukin-2, and antigen (CI). The resultant T-cell lines that proliferated to CI were CD3+CD4+CD8-CD28-CD25+CD49a+. Grey shaded areas represent staining with the appropriate isotype control. We were interested in comparing the Th1 and Th2 cytokine secretion profile of CI-specific cell lines. Cell lines generated from three patients were activated in vitro for 72 hours with plate-bound anti-CD3 (10 μg/ml) and anti-CD28 (1 μg/ml). Cell culture supernatants were harvested and assayed for cytokine content using a Bio-Plex assay. We detected abundant Th1 cytokines, including IL-2, IFN-γ, and TNF-α. Th2 cytokines, including IL-4, IL-6, and IL-10, were present in much lower amounts (Figure 3b). The chemotactic cytokine IL-8 was also detected in the supernatant of CI-specific cells and is likely responsible for the chemotactic properties of CI-activated PBMCs in the original publication of Stuart et al. .
Th1 polarisation of type I collagen (CI)-responsive T-cell lines. Cytokine expression of T-cell lines was determined by intracellular (IC) staining of PMA (phorbol 12-myristate 13-acetate)/ionomycin activated T cells. (a) We detected interferon (IFN)-γ staining but no interleukin (IL)-4 staining. Multiplex cytokine assay was used to analyse the cytokine profile of three T-cell line supernatants. (b) An excess of Th1 over Th2 cytokines was detected. PE, phycoerythrin; TNF, tumour necrosis factor. To confirm our findings, we also analysed intracellular cytokine production by flow cytometry, using fluorochrome-conjugated antibodies to IFN-γ and IL-4 as representative cytokines of a Th1 and Th2 profile, respectively. Indeed, intracellular IFN-γ staining, but not IL-4 staining, was detected in our T-cell lines, confirming the Bio-Plex data (Figure 3a). In this report, we demonstrate that in a subset of patients with SSc, CI may behave as an autoantigen and induce proliferation of a specific CD4 T-cell subset that has a Th1 functional profile. Our results are consistent with a previous study  in which 25% of patients with SSc demonstrated lymphocyte proliferation in response to CI, as measured by [3H]-thymidine incorporation. However, previous studies implicating CI as an autoantigen have not examined the phenotype or functional profile of the antigen-specific cells. T cells that recognise a particular antigen are present with very low frequency in the blood, and therefore direct analysis is technically challenging. We used CFSE labeling to allow identification of proliferating, antigen-specific cells after in vitro stimulation with antigen . This technique was recently employed to study lymphocyte responses to peanut allergens in children with peanut allergy . The advantage of using CFSE over the traditional [3H]-thymidine incorporation method is that antigen-specific cells remain viable, allowing for phenotypic analysis, cell separation, and further expansion. Assessment of lymphocyte proliferation using CFSE/flow cytometry correlates well with proliferation as measured by [3H]-thymidine incorporation, and CFSE does not interfere with lymphocyte proliferation or function . Mechanisms resulting in the breakdown of tolerance to CI are as yet unknown. CI is the most abundant of all collagens in humans. It is the most abundant collagen in skin, heart, and intestines, all of which are affected in SSc. CI is a heterotrimer molecule composed of two identical α-1(I) chains and one α-2(I) chain, with each α chain containing 1,014 amino acid residues. In mammals, CI is highly conserved, and there is a 92% homology at the amino acid level between human and bovine CI . It is possible that the immune response to CI plays a role in SSc disease pathogenesis or may be a secondary phenomenon due to epitope spreading later in the disease process. Immunity to CI has been described in other fibrotic conditions, such as idiopathic pulmonary fibrosis  and bleomycin-induced pulmonary fibrosis . Cellular immunity to CI may also be representative of a more generalised immune reactivity to extracellular matrix proteins in SSc. Laminin and, less often, type IV collagen can induce proliferation of SSc lymphocytes . Autoantibodies to fibrillin-1, the major component of microfibrils in the extracellular matrix, are present in approximately one third of Caucasian patients with SSc . In addition, both humoral and cellular immunities to elastin have been described in a subset of patients with SSc . The increased T-cell proliferation in response to CI in SSc may be reflective of an altered activation state of PBMCs in this condition. It has been demonstrated that CI can act as a potent co-stimulatory molecule and induces proliferation of in vitro activated CD4+ and CD8+ normal human T-cell lines in the absence of antigen-presenting cells (APCs) . Because our experiments did not involve concomitant ligation of the T-cell receptor with anti-CD3 and our experiments were conducted with whole PBMC populations containing appropriate APCs, it is unlikely that our results are due to co-stimulatory properties of CI. However, it is also plausible that animal serum in 'complete medium' may have resulted in non-specific T-cell activation that was augmented in the collagen-stimulated cultures. The CD4+ phenotype of CI-specific T cells is consistent with murine studies showing that type II collagen-specific T cells in the collagen-induced arthritis mouse model also express a CD4+ phenotype and express high levels of Th1 cytokines . CD28neg expression may reflect autoreactive properties of these cells, as has been demonstrated in other autoimmune diseases [30, 31]. However, we cannot exclude the possibility that CD28 loss occurred due to in vitro T-cell culture and repeated activation, which is known to result in downregulation of CD28 expression . The expression of CD49a (VLA [very late antigen]-1) on our CI-specific T-cell lines is in agreement with the work of Goldstein et al. demonstrating that CD49a+ T cells are a subset of Th1-polarised memory T cells that proliferate in response to recall antigens . The cytokine profile in SSc is skewed to a predominantly Th2 pattern, and this has direct consequences on the progression of fibrosis [34, 35]. In vitro, IL-4 promotes excess extracellular matrix production , and Th2 cytokines in vivo are associated with increased lung fibrosis in SSc . IL-10 also correlates with increased disease severity, increased skin thickness, and the presence of pulmonary fibrosis . 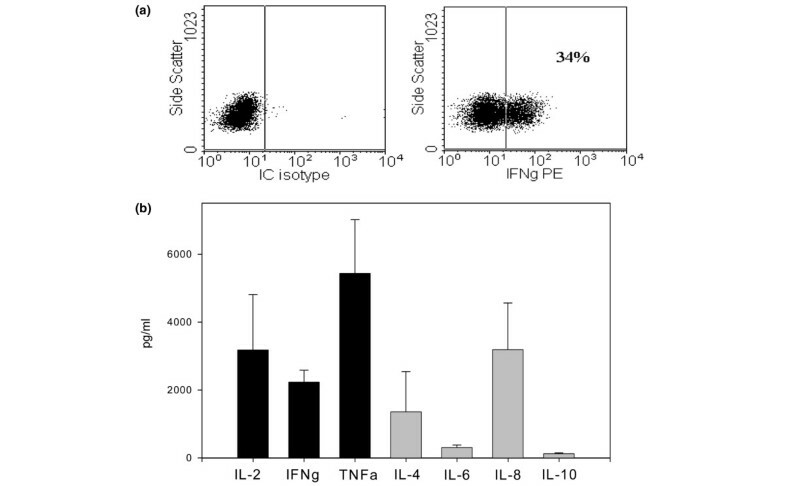 Interestingly, CI-responsive T cells derived from patients with SSc exhibited a Th1 profile, with a predominance of IL-2, IFN-γ, and TNF-α. When human T cells are repeatedly stimulated in vitro, they will often develop a Th2 phenotype , and therefore it is unlikely that our results are due to the in vitro T-cell culture. However, we cannot exclude the possibility that the IL-2 present in our cultures may have skewed T cells to a Th1 phenotype . Expansion of Th1 T cells in vivo may be beneficial to limiting disease progression. Lower serum IFN-γ levels have been associated with active SSc . Also, increased production of IFN-γ by CI-activated PBMCs correlated with higher forced vital capacity (Postlethwaite AE, personal communication), consistent with the known anti-fibrotic properties of IFN-γ . Patients whose bronchoalveolar lavage cells made IFN-γ mRNA but not type 2 cytokines were noted to have preserved forced vital capacity over time . The production of TNF-α by CI-specific T cells may also play a role in modulating the homeostasis of extracellular matrix in SSc. Indeed, TNF-α prevents the transforming growth factor-β-induced upregulation of α-2(I) collagen and tissue inhibitor of metalloproteinases 1 in dermal fibroblasts  and directly stimulates the production of matrix metalloproteinase-1 . Our study was limited to a fairly small sample size, making it difficult to perform detailed correlations among disease phenotype, disease progression, and immune responses to CI. However, the importance of immunity to CI is emphasised by the finding that oral administration of CI to patients with SSc modulates T-cell responses and may ameliorate the disease . Similar findings have been confirmed in a large multi-centre, placebo-controlled, randomised clinical trial that was recently completed . Circulating, memory CD4 T cells that proliferate in response to CI are present in a subset of patients with SSc but are infrequent in healthy or disease controls. Determining T-cell responses to CI in subsets of patients with SSc over time and using methods employed in our study may help to identify those who are most likely to benefit from CI-based immunotherapy. This work was supported by grants from the Scleroderma Foundation; the Office of Biomedical Laboratory Research, United States Department of Veterans Affairs; the Research Center of Excellence for Connective Tissue Disease, University of Tennessee Health Science Center; and NIAMS National Institute of Arthritis and Musculoskeletal and Skin Diseases Scleroderma SCOR (Specialized Center of Research in Scleroderma) AR 44890. KJW was responsible for the study design, data interpretation, and drafting of the manuscript. UN conducted the flow cytometry studies and analyses. LDC recruited study subjects and assisted with data interpretation and drafting of the manuscript. AHK participated in study design and data interpretation. AEP participated in study design, data interpretation, and manuscript preparation. All authors read and approved the final version.